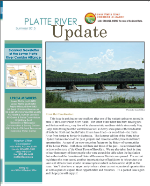 The LPRCA produces a biannual newsletter, Platte River Update. The current and past editions can be found in this section. If you would like to receive a print copy, please provide your contact information through the "Get Our Newsletter" link at the very top of this page or in the "What You Can Do" Section of the site. If you would like to submit an article please contact the LPRCA directly!